In fall 2008 I visited Boston, where a good friend gave me a tour of Harvard’s chemical laboratories. Passing by a small office, I saw through the window a thin elderly man in glasses hunched over a desk. He was turned away from me but the sign on his office said William N. Lipscomb. Since Lipscomb’s astonishing groundwork beginning in the 1940’s, boranes have provided fascinating examples of the diversity and possibilities of chemical bonding. Today, boron’s Lewis acidity is widely exploited in catalysis and Frustrated Lewis Pair (FLP) chemistry. The BH5 molecule, described as BH3 with sigma-bonded dihydrogen bound in an H2 manner, lies at the confluence of many currents of boron chemistry: the activation of hydrogen by FLP’s using borane Lewis acids; three-centre-two-electron bonding; H2 complexes, and the comparison of main group and transition metal chemistry. In a recent paper in Dalton Transactions, authors Szieberth, Szpisjak, Turczel and Konczol describe BH5 as “rare.” This is an understatement. As they report, its existence was confirmed in 1994 by infra-red spectroscopy in an argon matrix at 10-25K temperatures. In this paper, they present the modelling of the BH5 complex using Natural Bond Order analysis. Although this has been reported before, the authors use this paper to discern a unique and significant contribution to the stability of η2 H2 borane complexes: the back-donation of electron density from the B-H (or B-R) s-bonds into the σ* orbital of the bound H2, just as electron density from d-orbitals is donated to the H-H σ* orbital in transition metal H2 complexes. 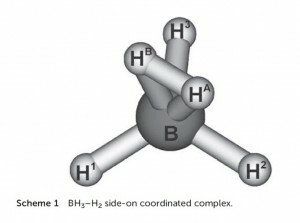 Their description of the Lewis structure of BH5 as a BH3/H2 adduct featuring a three-centre-two electron bond accounts for 99.1% of the electron density. William Lipscomb passed away on April 14, 2011 at the age of 91. But I am sure he would be pleased that work within his research area remains vigorously active. Enjoy a read of Autumn’s crop of HOT articles which are free to access for 4 weeks only! Our HOT articles have also been compiled into a collection and are available for viewing on our website. In their recent paper in Dalton Transactions, Stasch, Jones and co-workers describe the use of bulky ring-expanded N-heterocyclic carbenes (NHCs) for the stabilisation of Group 15 trichlorides, ECl3; E = P, As, Sb. The authors show that mixing 1:1 solutions of the ring-expanded, 2,6-diisopropylphenyl-subsitutied NHC “6-Dipp” with ECl3 (E = P, As, and Sb) affords satisfactory yields of the corresponding [(6-Dipp)ECl3] adduct, noting that the use of the alternatively-substituted mesityl-substituted carbene (6-Mes) led to a mixture of products thus highlighting the importance of the 6-Dipp ligand for stabilising the adducts. The group characterised each adduct using standard means, including NMR spectroscopy and electron-impact (EI) mass spectrometry. In the cases of P and Sb, they were able to use X-ray crystallography to determine the solid state structures of those compounds and observed that each pnictogen centre adopted a saw-horse geometry. When the researchers tried to reduce these adducts using either KC8 or a Mg(I) derivative, they were mostly unsuccessful, however they were able to reduce [(6-Dipp)PCl3] using the former reagent to form a unique dicationic carbene-stabilized P4 unit. Once again, the authors attributed the stability of this species to the steric profile of the 6-Dipp ligand framework. The X-ray crystal structure of the complex shows a P4-butterfly geometry stabilised by two carbene moieties. During the course of their reactivity studies, the group identified (6-MesH)2 as a byproduct resulting from reaction of in-situ generated [(6-Mes)PCl3] with KC8. With further optimisation, they revealed that this moiety could be accessed from treatment of [6-MesH]Br with KC8 – marking the first successful reductive coupling of cyclic amidinium ions. Along with NMR and X-ray crystal data, a cyclic voltammetry (CV) study was also performed on (6-MesH)2 to fully characterise this unique species. The successful syntheses of all these p-block NHC complexes pave the way for new discoveries in fundamental reactivity, bonding, and catalysis employing main group elements, further demonstrating the potential of these elements to perform exciting chemistry. 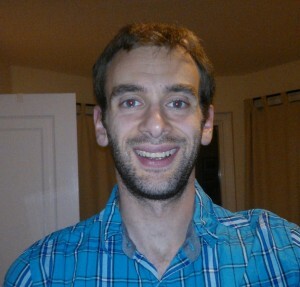 Marcus Drover is a Ph.D. student, co-supervised by Professors Laurel Schafer and Jennifer Love at the University of British Columbia. His research is focused on the preparation of low-coordinate RhI and IrI complexes for use in small-molecule reactivity. 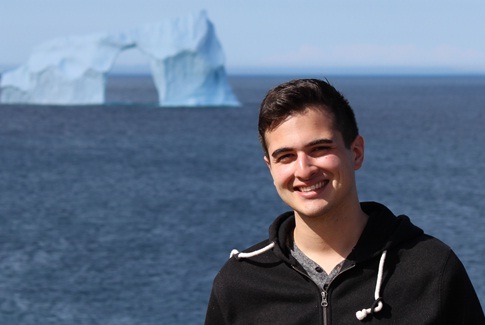 He grew up in St. John’s, Newfoundland and graduated from Memorial University (MUN) before beginning graduate school in 2012. You are currently browsing the Dalton Transactions Blog blog archives for September, 2014.